Happy Thanksgiving, everyone! Today I'm especially thankful for all the people who've helped out with the project and delighted to present some fascinating new information that's come in recently about several pre-Shortzian constructors—read on! 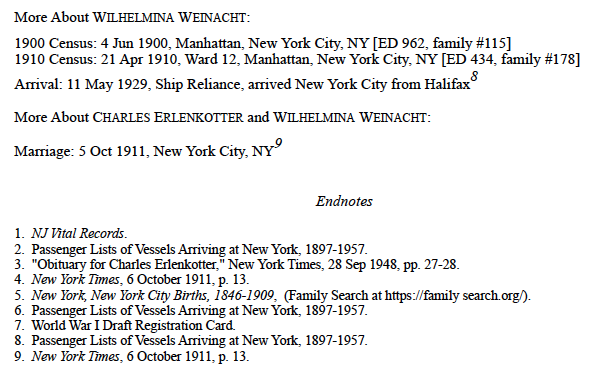 They give her name as Wilhemina Weinachten, whereas it should be Wilhelmina Weinacht. In almost all records, she used the shortened version Mina. We haven't been able to track down her death date, but it was after Charles's in 1948 and before her sister Henrietta's in 1951. 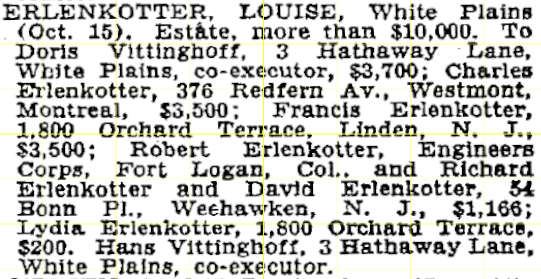 Don also enclosed this September 28, 1948, obituary from the Times, along with his current writeup on Charles, which "documents his early history with the Hamburg-American Line at San Francisco (1910–11) and as Southwestern regional manager at St. Louis (1914–17)." Image courtesy of Donald Erlenkotter. From an on-line search, I have the same set of 8 puzzles you have from the NYT. I searched some other newspapers and turned up a dozen of his puzzles in The Washington Post. The earliest was on 26 November 1939, and is titled "Meeting Place of the Puzzle Makers." The last was on 9 October 1944. 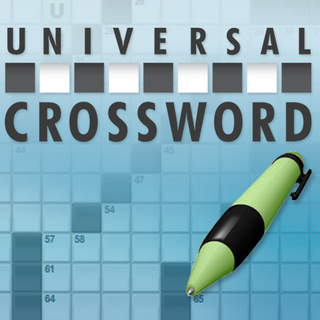 Some are captioned "Daily Crossword Puzzle." There are a number of entries for him on Ancestry.com under passenger lists. I included one in my writeup since it had dates of birth for him and his wife. There's another for the two of them in 1911 for their arrival from Bermuda - undoubtedly on their honeymoon. There's also an entry for him in Biography Index for 1949 - probably referencing the NYT obit. 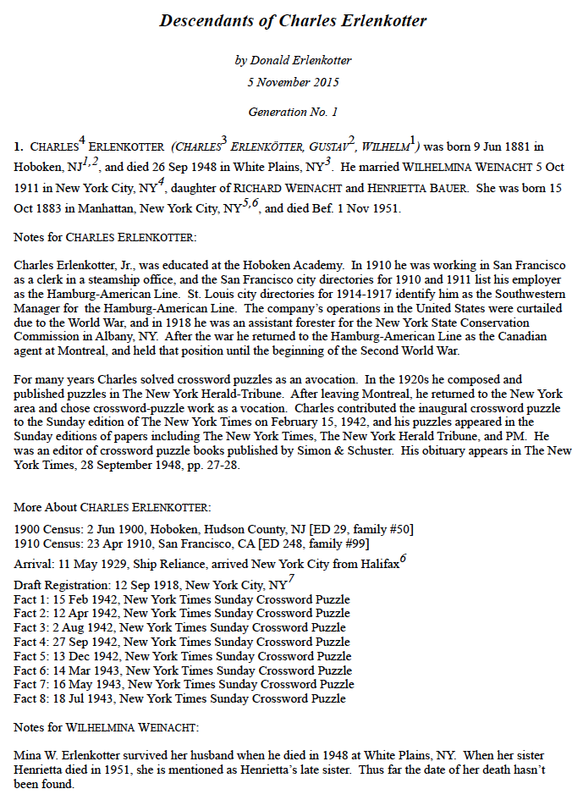 Unfortunately, I don't know of any photographs of Charles Erlenkotter. 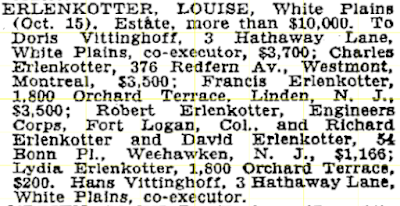 Documents are scarce in my family - my grandfather, Herman Erlenkotter, was a West Point graduate and artillery officer, so the family moved frequently and didn't spend much time in NJ or NY. He died in 1933, and the only photos I have from the family are from about 1912 into the 1920s, mostly of the children. Don mentioned, though, that while searching for more crossword information on Charles, he'd found more of his puzzles in other papers: 34 Sunday puzzles in the Springfield Republican (Springfield, Mass.) 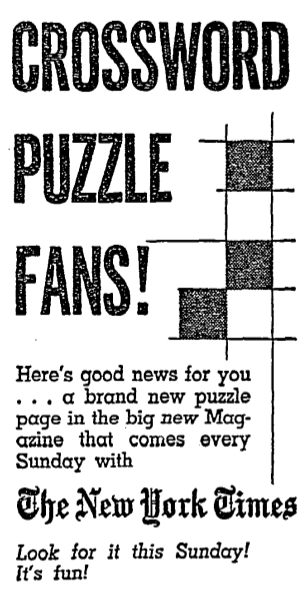 from 1934 to 1945; 4 puzzles in the Pittsburgh Daily Post (9/21/24, 6/11/25, 7/11/25, 11/7/28); 1 in the Oakland Tribune (Oakland, Calif.; 11/5/24); 1 puzzle printed twice in The Billings Gazette (Billings, Mont. 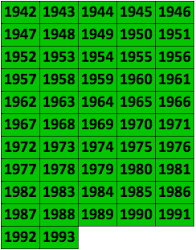 ; 10/19/28 and 10/21/28); 7 puzzles in The Charleston Daily Mail (Charleston, W.Va.; 7/3/32, 12/4/32, 2/19/33, 8/6/33, 1/6/35, 3/24/35, 10/8/35) under the heading "Meeting Place of the Puzzle Makers," as also seen in The Washington Post; and 1 posthumous puzzle published on 7/4/54 in both the Denton Record-Chronicle (Denton, Texas) and The Daily Herald (Provo, Utah). 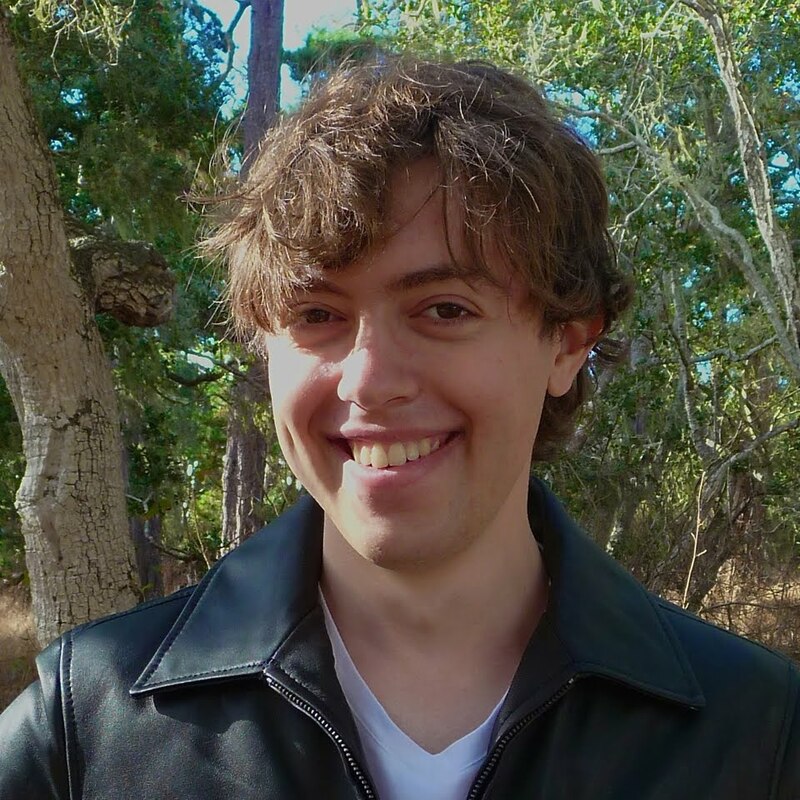 We haven't seen any puzzles by Mr. Erlenkotter, our Canadian contributor, on this page for some time. Whenever we do, though, we feel quite pleased about it, because we know that here we have a puzzle that conforms beautifully to all rules of puzzle construction - with some original additions of Mr. Erlenkotter's own. Have you ever noticed that these diagonally bi-symmetrical puzzles almost invariably have diagonal staircases running from the lower left-hand corner to the upper right? There must be some strange reason for it, because there's certainly no reason why the diagonals shouldn't run downward and to the right. Have you any theories on the subject? Don noted that the posthumous puzzle was copyrighted by Simon & Schuster and wondered whether Simon & Schuster might still have any files on Charles. He also wondered how puzzles were sold to newspapers: "It looks like the contributors probably dealt with newspapers individually—there's no indication that puzzles were syndicated like comic strips, or that newspapers copyrighted them." Here's a crossword puzzle "mystery": why, and how, was a puzzle by Charles Erlenkotter chosen as the first to appear inThe New York Times? As far as I can determine, there was no advance notice in the paper that puzzles were about to appear. They just showed up on 2/15/1942 on p. 36 of the NYT Magazine. The Times seems to have been in something of a state of disarray about this. It appears that they were revamping the Magazine in the aftermath of Pearl Harbor and the U.S. entry into WWII. On 2/21/1942, p. 8, they describe its coming features, and below the heading "If We Want to Win This War" they include a list of features "Fashions - Food - Home Decoration - Child Care - Crossword Puzzles" followed by the announcement "Sunday in The New York Times Magazine." The next day, p. 26, the contents IN TODAY of The New York Times Magazine conclude with "and a brand new Crossword Puzzle Page." No mention is made of the one the previous week. So, after missing the ball originally, the NYT was trying here to make up the lost ground. Now, back to the Charles Erlenkotter puzzle. 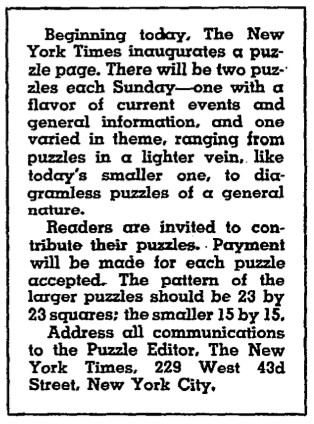 Certainly the 2/15/1942 puzzle wasn't submitted in response to any call for puzzles in the NYT since there wasn't any before this date. Surely the key here is Margaret Farrar. I doubt that she could have used any puzzles she may have already had on hand since there would be a conflict of interest with her other employers for whom she had obtained the puzzles - Simon & Schuster, etc. Most likely she contacted some of the puzzle constructors she knew and solicited puzzles from them specifically for the NYT. I would bet that she knew, or knew of, Charles. They had both been active in producing puzzles since the mid-1920s. When Charles returned to the U.S. from Canada at the outset of WWII, it's highly plausible that he would have contacted her since she was highly visible through the Simon & Schuster puzzle books, etc. He then could have sent her this new puzzle, and probably others as well. Don's theory makes a lot of sense—if only we had more details on exactly what happened back then! But at least we still have the puzzles and copies (if only digital now!) of the papers, which give us enough to make some very good guesses. I've obtained some additional information for Charles from passenger arrivals and border crossings on Ancestry.com. Have addresses for him in Irvington, NJ in 1926-1927, and in Montreal from 1928 through 1939. He was living in the Bronx from 1942 until his death in 1948. So far nothing on him from 1919 through 1926. I ran across a 1943 puzzle book in the Library of Congress (not from Simon & Schuster) that lists Charles as a contributor. Thanks so much again, Don, for all your help with this! It not only fills in many of the gaps in what we know about Charles Erlenkotter but also brings that whole era back to life. Moving on, in early October, Karen Richards of Eugene, Oregon, wrote to me about Betty Jorgensen. Karen followed up on my October 4 update and contacted Laura Jorgensen, who works at the University of Oregon and might have been a granddaughter of Betty. Unfortunately, although Laura's grandmother was indeed a Betty Jorgensen, she wasn't a puzzle maker. Thanks so much anyway, Karen, for following up on this—at least we can cross that lead off our list! Finally, the morning of November 18 I received an e-mail from Amanda Yskamp, one of William J. Yskamp's daughters. She had discovered the July 29, 2015, post and confirmed that we had indeed found the right person—William was her father, and he had passed away eight years ago on that very day. Amanda noted, "He was a wonderful wordsmith, and would have been pleased to know that his legacy lives on." Yes, that William J. Yskamp was a clever constructor of Sunday puzzles. He stopped constructing, alas, after one of his puzzles was published erroneously by the Times under someone else's name. I'm delighted to see that you found him and charmed to see his high school yearbook picture. Although I met Mr. Maleska only once, at a dinner given him by New England constructors, I have many memories of his editing style. For example, he labeled Bill's definition of Onan--"he cast his seed on the ground"--as "too seamy" for NYT solvers; and he changed it to "______ even keel." The Times published a correction the week after the misattribution, but that didn't attach Bill's name to his puzzle. That was his last contribution to the Times. 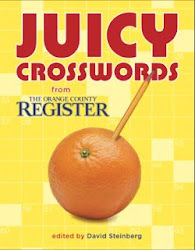 Although Claire didn't remember when exactly that was, I checked XWord Info and dug through my records again, and the last puzzle William published in the Times was on August 4, 1985; although the puzzle itself was correct, the author and title were incorrectly listed as Bert Rosenfield and "Age 35: Aaugh!" Bert Rosenfield's puzzle subsequently appeared eight weeks later on September 29. 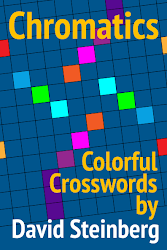 If only Maleska had correctly printed the author and title of William's puzzle—who knows how many more William J. Yskamp puzzles might have appeared in the Times and been up on XWord Info today? Thanks so much again, Claire and Amanda, for contacting me about William! On that note, I'll sign off for now, especially since I smell the beginnings of Thanksgiving dinner! Although I'll be busy for the next couple of weeks studying for finals, I hope to have another post up sometime in December for the holidays.